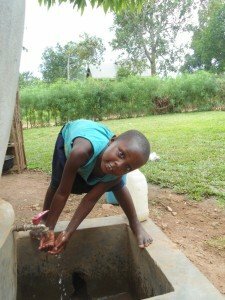 Clean water is vital for us all, but in the fast growing semi-urban sprawls in Uganda, getting your children fresh water is a gamble every day. Southwest of the capital city Kampala, Wakiso community is one of the fastest growing semi-urban centres in Uganda, with a population of around 30,000. As the city grows, the swamps that serve as water sources get more and more contaminated. Some families resort to buying water from vendors if they can afford it, but no one can be sure of the source. The result is children are vulnerable to parasitic worms, diarrhoeal diseases and skin diseases that can blight their childhoods and cause serious illnesses and even death. While the government worked on larger projects to create deep boreholes, ChildFund introduced a Direct Action project designed to help families furthest from safe water sources to safely capture, store and use rainwater. At the same time, health training showed them how best to use clean water to prevent illness and associated health problems. The project, generously supported by employees at the Bank of Ireland, delivered clean water and improved hygiene and sanitation for households that were typically more than an hour’s walk away from safe water sources. The beneficiaries were chosen by the community and included families of children who are enrolled in ChildFund’s sponsorship programme, families with children below 5 years of age and households caring for older people and those affected by HIV. As well as installing water tanks, the project included training on best practices like washing hands, and embracing healthy sanitation. This meant that the whole family was likely to get the full health and well-being benefits from having fresh water on tap and that they would be able to pass on that knowledge to new families as the project expanded. This whole project worked within a budget of approximately €12,000, transforming families’ lives, freeing adults and children from many hours of water collection each day and helping them to stay healthy. While some of our projects are sponsored by Irish companies like the employees at Bank of Ireland, our Direct Action projects can also be sponsored by individuals, starting from as little as €10 a month. If you would like to play a part in transforming a local community, you can support our new Direct Action project right now. Support our Direct Action project now.